As gentrification pushes African-Americans, should the city step in to protect their interests? Witherspoon’s experience mirrors that of the neighborhood as a whole. The number of African-Americans in the Central District has steadily declined over the past decades, with the percentage dropping from 64 percent in 1990 to 28 percent in 2010. The number of white residents increased in nearly inverse proportion. His own life tells the story. Born in Seattle in 1958, Witherspoon attended Garfield High School and was raised in a Central District that was predominantly African-American. After decades in the C.D. and then South Seattle, he purchased a home with more space in Renton, a decision he now regrets. “I can’t afford to move back to the Central Area,” he says. The congregation of his church, near 23rd and Union, is seeing the same pattern. Today, he estimates only 40 percent of his predominantly African-American congregation lives in the neighborhood, down from 85 percent before. Parishioners now spread out across the southern suburbs, such as Renton, Federal Way and Auburn. The shifting demographics in the Central District are not just numbers on paper. The neighborhood, bordered by Madison Street to the north, 12th Avenue to the west, I-90 to the south and Martin Luther King Way to the east, has long held a special place for black Seattleites. Its main artery is the 23rd Avenue corridor, home to businesses and restaurants spanning the African diaspora and beyond. The district also includes, at 23rd and Jackson, the Starbucks Community Store, a hub of the East African community, and at 23rd and Cherry, the community’s heart and soul, Garfield High School. For many, the demographic shift marks a loss of culture and community—and some are hoping to stem the tide. One effort to preserve some of what makes this neighborhood unique is coalescing at City Hall, through the 23rd Avenue Action Plan. This “city-community collaboration” to create “a shared vision and action plan to improve the health and equity” of three Central Area hubs—23rd and East Union, 23rd and East Cherry, and 23rd and South Jackson—is led by the Department of Planning and Development’s senior planner Quanlin Hu. In a shift from the city’s regular neighborhood planning process, the team carefully identified community stakeholders and engaged in concerted outreach to get their involvement in the process. The result was that during 2013 more than 600 people participated in the public meetings and planning processes. They represented a diverse array of ethnic and economic backgrounds—including a significant number of longtime residents of color. In addition to stakeholder meetings, community workshops and community engagement, an advisory core team (ACT) of 15 key participants was selected to represent community interests. More than half of the ACT is African-American. In addition to the ACT, five action teams were developed from the planning process, made up of interested community members. These teams focused on issues from cultural preservation to livable streets. Williams knows firsthand the impact of Central District gentrification. “A lot of people I know lost houses,”she says. “There may be apartments for people like me, but there are not houses. Everybody moved south—to Kent, Renton.” Williams now lives with her son in Rainier Beach. Despite the mistrust, community engagement in the action plan has been high. The final product, the action plan itself, was completed in the fall. The final document, available soon, will lay the foundation for planning decisions that will involve zoning in the commercial hubs. For example, in planned development at the current post office at 23rd and Union, the strong community preference was for multiple smaller businesses versus a big-box store. When the zoning decisions are made for that parcel, the community input will be factored in. The Central District action plan is the city’s second such initiative. The first effort started in 2011 in Rainier Beach, a process with fewer participants but one that built a community-centered road map for the neighborhood to follow as it made development decisions. This includes zoning and land-use guidelines as well as an urban design framework. One prominent member of the advisory core team is Wyking Garrett, the founding director of the Umojafest P.E.A.C.E. Center and a member of the leadership team behind the Africatown Innovation Center at the Horace Mann school building. Before coming to an agreement to leave the Horace Mann building during its renovation, the Innovation Center operated at the former school on Cherry, offering a space for youth education, technology access, African-American heritage immersion and a middle school for Muslim girls. On a visit in October, the center was bustling: African-American youth using computers, community members creating banners against racism, young people painting a mural in a garden. Throughout the building were symbols and reminders of a proud black history. This is one of Garrett’s visions for the Central District: a hub for African-American-centered education and learning, a safe place for youth to grow their skills. Yet in mid-November, the last holdouts occupying the school were removed, and four activists were arrested during the eviction. The Innovation Center is now looking for a new location. Garrett’s vision is to use the model of Seattle’s Chinatown–International District to create a core area for culture, goods and food of the African diaspora in the Central District. Longtime African-American neighborhood mainstays, such as Catfish Corner and Ezell’s, are now joined by more recent East African immigrant restaurants, such as Cafe Selam and Assimba. 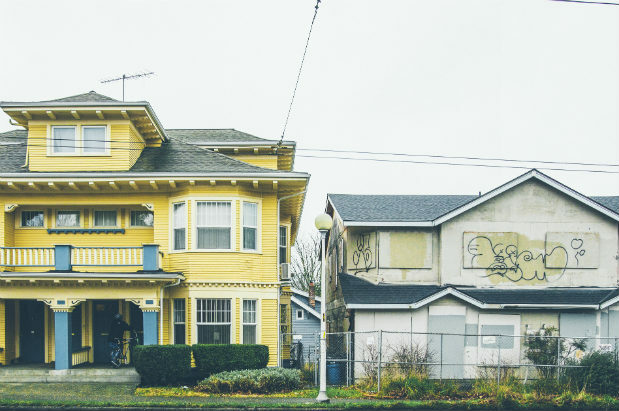 Much like in Seattle’s Chinatown–International District and ethnic hubs across the country, Garrett envisions Africatown as a destination for all people who value the contributions and history of African-Americans. At a January community meeting, the crowd erupted in applause when after an Africatown presentation by Garrett, the new-mayor Ed Murray said he felt the city should refer to the area as Africatown–Central District. Garrett knows that his vision for the Central District is not shared by everyone, that for some, “gentrification” is not a bad word. “You have some people on the committee who want to eliminate the black presence; gentrification cannot happen fast enough for them” he says. Quintard Taylor, a professor of American history at the University of Washington and the author of The Forging of a Black Community: Seattle’s Central District from 1870 through the Civil Rights Era, says transition has been a constant in the history of the Central District. Redlining and restrictive covenants established in the early 1900s were created based on an area’s ethnic and economic composition. This practice enforced neighborhood segregation and ensured that African-Americans would not be able to move outside the Central District. From the segregation, a community was born. Examples of these changes abound: the African American Facts newspaper, long a huge landmark on Martin Luther King Jr. Way and Cherry Street, is now a doggy day care (the paper has moved to a tiny office in Madrona); a Central District icon, Thompson’s Point of View restaurant, is now a hipster bordello-themed bar—its patrons, formerly made up of blacks, now almost all whites. Ryan Curren is the program manager for southeast Seattle’s Community Cornerstones innovative equitable development project, which is an intentional process to ensure low-income people and people of color are involved in development decisions. Yet he says that stopping gentrification is not an option he thinks is likely. “Mitigate? Yes. There is no…case study anywhere in the United States that neighborhoods that were in high demand either didn’t change or that all existing residents and businesses were able to stay.” In this context, his project aims to prevent involuntary displacement and create opportunity. One of the potential pot entrepreneurs is Ian Eisenberg, a longtime Leschi resident and member of the action plan’s advisory core team. He has applied to open a marijuana shop in the area. For years he had been asking why someone didn’t fix up the 23rd and Union intersection. There was a boarded-up building where Philly’s Best used to be, and a vacant lot on the southwest corner. Finally, in May 2010, he decided to buy them himself. The restaurant space, home to well-known violent tragedies over the years, became Med Mix, a Mediterranean restaurant. Following exuberant stories about finally ending the “curse” of the Philly’s Best corner, in August, someone set fire to the Med Mix building. Ruled an arson, surveillance cameras caught the arsonist intentionally setting the fire and writing “4 Pratt & Trayv” on the wall next to the restaurant, a nod to slain civil rights activist Edwin Pratt and Florida teen Trayvon Martin. The wall, which once held a mural of Pratt and Malcolm X, was painted over by a previous owner. It had been tagged too many times to repair. As to the motive behind the arson? Many theories circulate online, but there have been no arrests. In January, Med Mix owner Otmane Bezzaz announced he wouldn’t reopen on the corner because the damage is too extensive, but says he’s looking for another way to keep Med Mix in the C.D., where he lives. At press time, Eisenberg had just sold the vacant lot on the southwest corner (for $3.8 million) to Lake Union Partners, which plans to develop a six-story apartment building with retail at street level, starting this spring.